Pin Sharp Shark !!!!!! !, a photo by bev.c2007 slowly getting better on Flickr. Check this out. 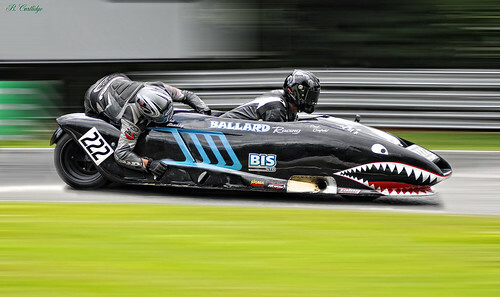 First, it’s a pretty cool photo of a racing motorcycle with a big shark’s mouth painted on the front. Second… I forgot what was second. But still, a pretty cool photo. I believe the 2nd person in back is there to shift their weight around to change the balance of the bike as it moves down the track. I’m not sure if this is a drag-racing bike or a road-course racing bike. According to the Flickr page for the photographer, this was taken with a Nikon D90. Excellent job !